The latest product to be unveiled by tech giant Google was not a new smartphone or wearable device or search feature designed to be used by millions of everyday consumers. Rather, it was a US$6000 whiteboard designed to be used in your office conference room. 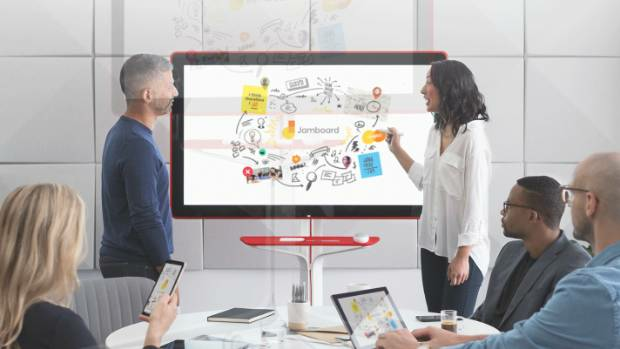 The release of Jamboard puts the Silicon Valley behemoth into the niche but increasingly competitive market of interactive whiteboards, the high-tech equivalent of those dry-erase boards that employees use to scrawl out diagrams, lead presentations or brainstorm new ideas. Microsoft and Google have both got into the interactive whiteboard market this year, creating new competition for the largest and most entrenched player, Smart Technologies, a Canadian firm recently acquired by Foxconn. “The last piece of equipment in the office and classroom that hasn’t made it into the modern age is the whiteboard,” said Smart Technologies chief technology officer Warren Barkley. Though commonplace today, the standard whiteboard is an innovation itself. Popularised in the late 1980s and 1990s, the whiteboard has, in many instances, replaced the dusty blackboard that always left hands, clothes and floors coated in a thin layer of chalk residue. As with a whiteboard, employees can post their ideas, documents and images on the Jamboard, only they won’t need markers, tape or sticky notes to do it. The digital whiteboard is a more modern invention and it continues to evolve. Smart Technologies takes credit for creating the first interactive whiteboard in 1991. Barkley said those devices were primarily large display devices that used projectors and had maybe one or two touch points. Today, interactive whiteboards come with high-tech LED touch screens whose ease of use more closely resembles a tablet computer. That evolution has come with fits and starts, he said, and new arrivals could advance it further. Google’s Jamboard is a 55-inch, touch screen monitor that connects to the cloud and taps into Google’s G Suite of productivity apps, including Google Drive, Docs and Calendar. Equipped with machine learning technology, the board is marketed as a tool for companies to make information gathering and brainstorming more seamless. It’s unclear whether Jamboard will have a meaningful impact on Google’s income. It strikes a different tone from the company’s other products, which are generally lower cost and marketed to the masses, because the electronic whiteboard is distinctly aimed at a business crowd with a hefty IT budget. Google also faces stiff competition in the workplace technology market, said Vanessa Thompson, a research analyst at IDC, a market research firm specialising in technology. In March, Microsoft began shipping its own interactive whiteboard, called Surface Hub. Much as Jamboard integrates with Google’s other products, Surface Hub integrates with Microsoft’s established slate of workplace software, including Skype and Microsoft Office. The 55-inch Surface Hub sells for US$8999, and the 84-inch version goes for US$21,999. Interactive whiteboard purveyors say their products meet that need. Collaboration has become harder in office environments where some employees work remotely or travel often, and information is increasingly stored in digital formats and shared through email. Having a digital interface that all workers in a meeting can connect with to share information, video conference and otherwise engage makes those gatherings more productive, they say. But IT trends could also make the large capital investment needed to purchase the boards harder to justify, Thompson of IDC said. “There are some macro trends impacting the way we work, like decentralisation in large organisations, small team-oriented work, personal productivity tools augmenting tools provided by organisations,” Thompson said.